Other Products by EHP Labs. Search other Plant Protein Powder products. * All Natural Sweeteners and Flavours! 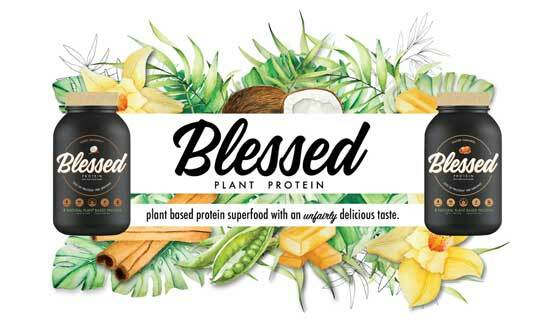 EHP Labs Blessed Protein is the perfect balance between flavour and nutrition, having turned what most would call a bland pea protein isolate into something else entirely. What makes this product even greater is the exclusion of artificial sweeteners from the formula, the most popular of which on the Australian market are Sucralose and Acesulfame Potassium. Importantly, the former contains chlorine. That's right, chlorine. The same chlorine that we put in our swimming pools to prevent algae growth. Sucralose is actually a molecule composed of sucrose (common table sugar from sugar cane) and chlorine, which makes for a super-sweet final product. Though minute amounts of sucralose are used compared to the equivalent in sweetness from sugar, and we are supposed to not be able to absorb it, we do need to consider bio-accumulation, I.e., multiple doses daily over decades, and hyperpermeable intestinal mucosa. This latter complex of words actually refers to "leaky gut", and the absorption of molecules that we shouldn't absorb, such as undigested food particles and perhaps even sucralose. And given the prevalence of digestive disturbances these days, likely due to poor diet, psychological stress and less than ideal eating habits ... it make sone wonder. In fact, we excrete approximately 96.7% of sucralose, on average, retaining the rest in our bodies. 14.5% of the excreted portion is removed from the body via the urine, which indicates that we absorb at least 14.5% into the bloodstream1. With EHP Labs Blessed Protein, however, we don't have to worry. Its is 100% artificial sweetener free and full of natural flavour. The Pea Protein Isolate within EHP Labs Blessed Protein contains the all-important essential amino acids, three of which are the branched chain amino acids: Isoleucine, leucine and valine. These amino acids are important and not to be underestimated for general health. Everyone in the health and fitness industries are talking about protein, which means that we many could label this macronutrient as another fad. Hopefully, however, this one is here to stay. Though popular, essential amino acids are the most important nutrients for the human body after only water and oxygen. Interestingly, research indicates that pea protein isolate may be just as good as whey protein isolate at promoting muscle thickness in resistance trained subjects2. Obviously, not everyone will want to promote muscle thickness. Fortunately, as with any protein, pea protein will not thicken up your muscles unless the training is promoting this biological effect. You could say that a high quality protein powder helps our body to adapt to the type of training we do, and also makes for an excellent supplement when dietary sources are low. It is a scientifically consolidated fact, in large part due to the lifetime research of Dr Robert Wolfe, that essential amino acids are responsible for stimulating muscle protein synthesis, which is the anabolic pathway of the body relating to muscle3. So, if a quality plant-based all-natural protein supplement is what you seek, EHP Labs Blessed Protein has got you covered. It's just an added bonus that it tastes sensational and is free from common chemical-based sweeteners and flavours! Mix one scoop of protein with 250ml chilled water or milk substitute. INGREDIENTS: (Choc Coconut): Raw Activated Pea Protein Isolate (Sprouted), Cocoa Powder (Processed with Alkali), Natural Flavours, Sunflower Oil Creamer, Inulin Fibre, Gum Arabic, Rock Salt (Sodium Chloride), Natural Sweeteners (Stevia Extract, Rebaudioside A), Psyllium Seed Powder. This product is manufactured on the same equipment that processes PEANUTS and TREE NUTS.